Waiting patiently for the right wave is critical if you want to get a good ride and impress the judges. Mati, January 2011. Mati, the capital of Davao Oriental province in the Philippines, is probably best known for the Sambuokan Festival, a multi-day extravaganza of local arts, activities and talent, held to showcase a message of unity and peace from the people of Mati. 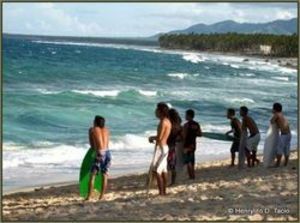 But not too many people know that Mati is also famous for its Annual Skimboarding Challenge. For the uninformed, skimboarding – also known as skimming or skiffle boarding – is a water sport in which a short board is used to ride an incoming wave. A skimboard is simply a sleeker, smaller (around 6kg) surfboard, typically made of smooth marine plywood and fiberglass, that you can have great fun on even when the waves aren’t surfing-friendly. Dahican Beach is slightly off the usual tourist trail - but there are places like this to stay when you get there. My two friends (Dr. Dante Comedido and Armand Mortejo) and I heard about the competition while we were visiting Mati for the festival. “I would love to go and see it,” said Doc Dante. Armand agreed. Unfortunately, it was raining. But the weather didn’t put us off. We set off to Dahican Beach, about 15 minutes away from the heart of the town and famous for its crystal clear blue waters and its seven-kilometers of pure white sand. Getting there meant driving over some rough roads but there was no entrance fee as it is open to anyone – locals and foreigners. About 40 young and adult skimboarders had turned up to compete, from many towns around the area. Some had travelled quite a distance to test their skills at what could be called the skimboarding capital of Mindanao. According to Richard L. Villacorte, the Mati municipal administrator, there are several reasons why it deserves the title. “Most importantly, the waves are what skimboarders are looking for – not so tall and not too short. And our sand here is white unlike others which are dark or black,” he adds. Jema Flora, a skimboarder from General Santos City, agrees. “The waves here at Dahican Beach are great, compared to what we have in Sarangani, where we practice,” he says. The competition had two categories: Champion and Advanced. Although we were there only for the elimination rounds, we were fascinated by the competitors as they skimmed and did “flatlands” which involve skateboard-style tricks on the wash of waves, but without catching shorebreaks. Today, this extreme water sport is already popular in the United States, Canada, Australia, Spain, China, Malaysia, Japan, and Singapore. 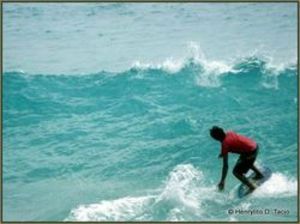 In the Philippines, skimboarding was first introduced in Tanauan, Leyte, which has become the de facto skimboarding capital of the Philippines. ... but get it right and the stunts you can do on a skimboard will amaze the casual onlooker. We stood watching, talking with George “Jun” Plaza, the man behind the Amihan Surf and Skim Team. The word “Amihan” comes from the northeasterly winds that blow through the country from November to March. “These winds create powerful waves which are perfect for skimboarding and surfing,” Jun says. The the Amihan Surf and Skim Team is actually a group of young boys that teach surfing and skimboarding to visitors to Dahican Beach. 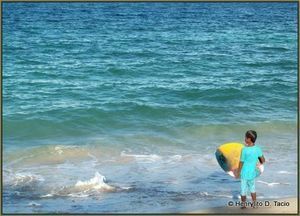 And, not surprisingly, Jun urged us to learn how to surf. I told him I had enough of that already. “I learned at Tybee Beach in Savannah, Georgia some years back,” I smiled. Armand and Doc Dante were also hesitant – but Jun wouldn’t take no for an answer. So, Armand finally relented and gave it a go. About twenty minutes of watching later, Doc Dante suddenly gave me his camera, car keys and cellphone. “Where are you going?” I asked. He said that since he was already there, why not take the chance – and plunged in. Age is no barrier to skimboarding. Just get a smaller pair of pants and skimboard and you are up there with the experts! We found out later who emerged Challenge winners. Sonny Boy “Bayogyog” Aporbo from Mati took the top prize in the Champion category and took home P12,000 and the coveted Mayor’s cup. Roberto Yanuari, Jr. and Rodel Patawi were runners-up. In the Advanced category, Jigo Missiona from Surigao won the P5,000 cash First Prize and a trophy. Glenn Donaire and Jaspher Consigna were Advanced runners-up. 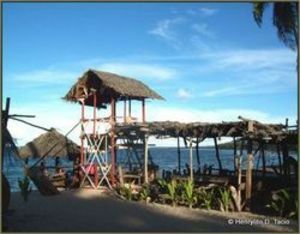 Mati is accessible by land and sea transportation, with Davao City as the entry point. Vans for hire are readily at Villa Victoria Terminal in Bajada and commuter buses leave the Ecoland Bus Terminal every 30 minutes. Newer PostTimor-Leste First Adventure Race Through Dili, Christu Rei, Dare to Comoro – with Sweat!